As I walked out to the roastery, the crisp night air reminded me that winter had finally arrived. I lit the roaster to warm it up while I weighed out the coffee… 20 pounds of Papua New Guinea and 20 pounds of Bugle Blend. 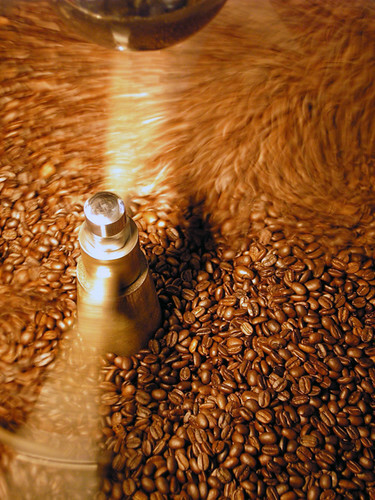 With its 75,000 BTUs of heating power, the roaster broke the chill in the room as it came up to temperature. I loaded up the hopper and let the green coffee drop into the drum with a whoosh. The coffee began its rhythmic shoosh-shoosh as it was tossed about inside the drum. I plotted the time/temperature profile, adjusting the flame as the roast progressed. Every few seconds, I could see a little finger of flame peek out from the fire box. Soft pops, not unlike the sound of popcorn, signaled that the coffee was entering first crack, when the remaining moisture in the bean bursts out in a puff of steam. The scent of grass changed to bread as the coffee darkened and neared the final stage of roasting. I pulled a sample of beans, looked... smelled… close, but not yet ready. I pulled a few more samples with the tryer, a small scoop that inserts into the roaster, and could see that finally, it was ready to drop into the cooling tray. Moving quickly, I turned on the spinning arms of the agitator, cut the flame back, and lifted up the drum door, releasing the chocolate-colored beans from the roasting chamber. The beans cooled quickly as the agitator stirred and the last bit of smoke wafted upward.